One of the largest cleanup challenges in the world is the 580-square-mile Hanford Site in southeast Washington State. Four decades of nuclear energy production, spanning World War II through the Cold War, left an array of chemicals in soil and groundwater across the site. As cleanup progresses, site managers need to identify exit strategies for remedies such as groundwater pump-and-treat systems. These decisions require the ability to quantify trends in data and calculate technically-defensible metrics that describe contaminant concentration levels in space and over time. To help site managers make informed cleanup decisions, PNNL developed a set of online software tools that perform multiple types of analyses on environmental data collected from over 2,000 groundwater monitoring wells. This suite of tools, funded by the U.S. Department of Energy’s Deep Vadose Zone Program, is called SOCRATES. SOCRATES stands for a Suite Of Comprehensive Rapid Analysis Tools for Environmental Sites. It’s also a clever reflection of its namesake. SOCRATES currently includes four modules, each with an instructional user guide. GALEN: Groundwater AnaLytics for the Environment. 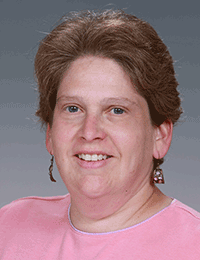 GALEN provides analyses related to hydrologic data. Specifically, GALEN analyzes hydraulic head (water level) data to understand changes over time and to determine groundwater flow directions and gradients. PLATO: PLume Analysis TOol. PLATO provides a framework for seamless access to multiple data sources, allowing a user to quickly and consistently perform analyses to quantify groundwater contaminant plume dynamics and answer questions that support remedial decisions. PLATO implements data-driven, quantitative analyses based on published U.S. Environmental Protection Agency guidance (EPA 2002, 2013) and standard statistical methods. Analyses include well-pair (flow path), multi-well (plume), and single-well attenuation rate calculations using measured concentration data. Socrates, regarded as one of the wisest people of all time, pursued knowledge through questioning, then examining the implications of the answers. The modules in the SOCRATES tool suite are named after like-minded Greek philosophers from ancient times. GALEN: Galen was a physician who discovered that arteries carry blood. He compiled all Greek and Roman medical literature available at that time. GALEN analytics focus on flow of groundwater rather than blood, utilizing a compilation of Hanford well data. PLATO: Plato, the preeminent Greek philosopher of his time, placed an emphasis on one’s abilities to think and reason rather than depending on the senses to perceive knowledge. Similarly, the PLATO toolset provides contaminant concentration analytics that offer objective metrics for decision-making. ION: Ion of Chios, a versatile writer, dramatist, lyric poet and philosopher, placed himself as interpreter of history and the human condition. 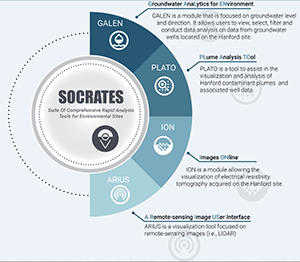 Within the SOCRATES toolset, the ION tool is used to view subsurface images interpreted from ERT measurements of electrical conductivity. ARIUS: Arius was a teacher of philosophy and advisor to the emperor Augustus who summarized Peripatetic and Platonist philosophy. The term Peripatetic means "of walking" or "given to walking about.” The ARIUS interface uses remotely-sensed data to identify changes in surface elevation, as a surrogate for land surveys requiring labor-intensive walkabouts. ION: Images Online. ION provides image visualization capabilities for electrical resistivity tomography (ERT) data acquired on the Hanford Site. ERT is a geophysical technique for imaging the subsurface using electrical resistivity measurements made at the surface, or by electrodes located in one or more boreholes. Because subsurface electrical properties correlate to pore fluid properties and lithology, ERT can be used to track subsurface amendment delivery and contaminant plume movement over time. The interface is currently in beta development, along with its user guide. ARIUS: A Remote-sensing Image USer Interface. This visualization tool integrates remote-sensing images obtained by LiDAR and satellite data to reveal changes in surface elevation over time. This information can be used for early detection of waste site subsidence and potential catastrophic events. While land-based routine physical surveys are feasible for monitoring changes in surface elevation, airborne or spaceborne remote sensing methods are more cost- and time-effective. This interface is also a beta version, and the user guide is under development. With SOCRATES, DOE and site contractors can use easily accessible, rapid and powerful analytics to identify data trends, consistent with the EPA’s Groundwater Road Map and EPA-recognized analytical techniques. PNNL publications (Truex et al. 2015, Truex and Johnson 2016) describe how these analyses can be applied to provide a technical basis for assessing remedy performance and optimization, as well as the potential to transition to alternative remedies or remedy closure. With this information, DOE can consider phasing out active treatment technologies when they become inefficient. Data for SOCRATES come primarily through the Hanford Environmental Information System (HEIS) database, maintained by a site contractor. Data synchronization between HEIS and SOCRATES occurs daily to assure that data remain current. Using the power of advanced network computing, complex calculations and graphics generation take only minutes compared to labor-intensive spreadsheet updates or paper studies of the past. In fulfilling their namesakes, SOCRATES tools provide practical results from scientific data to ‘discern the truth’ for DOE, and ultimately advance the groundwater cleanup mission at Hanford. PNNL Team: Patrick Royer, Chris Johnson, Paul Weidert, Mike Truex, Jason Bai, Ryan Williams, John Garza, and Vicky Freedman.